Digistamps4joy and Shelly's Image is having a combined challenge. You have to use both the image Peter and Egg Basket in a project. The images can be requested and the details are at http://www.papercraftplanet.com/group/digistamps4joy. This is project 3 - card. The embossing is basket weave spellbinders. 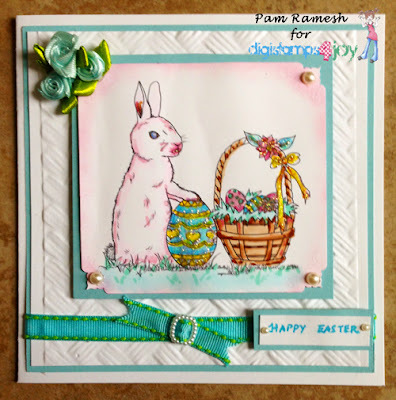 I love the little pearl ribbon sliders and so decided to add them to the card. Thank you for sharing your creations. Looking around your site, I am impressed with your talent. Keep up the good work. Simple, yet elegant. Love that embossing and the slider! Thanks for playing in the Get Together event. This is so pretty and I love the aqua colours. So pretty. I love the beautiful colors you used on the white background. Thanks again for playing along in our Get Together Challenge. It has been such fun to visit your blog.